A pleasant Monday evening and I fancied a walk on the beach. Again. 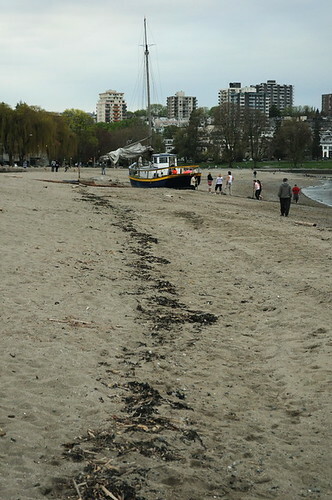 I headed for Kits Beach mostly to see for myself the efforts to free a small boat that had blown ashore in a recent storm. The Tuesday Sunrise was indeed still high-and-dry and half a dozen people were digging out a trench on the beach to enable water to flow around the boat at the next high tide. I felt a bit self-conscious taking photos while they were working so hard (I’m not a great people photographer) so I wandered off down the beach a little further before heading over towards the Maritime Museum. I normally avoid the dog beach but tonight I walked along it, having watched the antics of dogs and owners from up on the path. One dog took exception to me and barked from close quarters. I did my best to ignore it and kept walking, which seemed to work. I spotted a seal about 30 metres off shore and climbed the rocks up onto the path hoping for a better view. I passed the time watching the cormorants zip by close to the water, and soon gave up on the seal. I walked to the end of the point and watched a pair of cormorants fishing. A heron flew over, squawked and landed on a nearby pile at the small marina (with the little Viking longship). Movement in the water caught my eye, and I watched a dark drown shape swim towards me. An otter! It lifted its head above the water, spotted me, and turned to head over to the dock. I snapped a couple of photos but the low light and movement made them blurry. But it was a treat seeing it at all. With the daylight fading, I figured it was time to head back home. Walking round to the other side of the marina I saw a dark shape on the shore. Could it be? 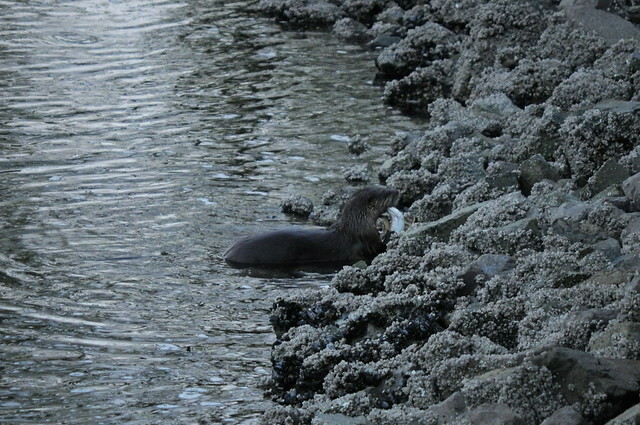 Yes – it was the otter, and it was feeding. I moved slowly along the path until I was alongside, the otter no more than 10 metres away. I took a few more photos and a minute or so of video. I reviewed what I’d taken and wondered if I could get closer. I moved round the corner onto the grass and crept towards the edge of the bank. I peered down over the rocks and there not more than 5 m away was the otter and the sizeable fish it was feasting on. I took as many photos as I could, and more video. Chomp, chomp, crunch, crunch – I worry about encountering fish bones, but the otter had no such problem devouring the whole lot. Head, tail and everything in between. We locked eyes for a moment, then it turned and swam off. I looked up and saw the city, and thought how amazing it is to live in such a place.